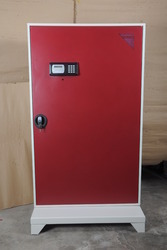 Our range of products include metal key box, key box, domestic key safe, domestic stainless steel keybox, industrial keybox and builders choice key box. ExternalSize 381 x 381 x 318(mm); 15 x15 x12. 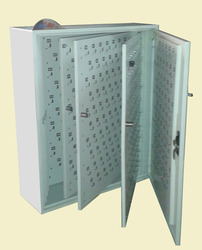 Shri Hari Industries are the Manufacturer, Supplier and Exporter of Key Chest. Price range start from 14999 - 124999. Production Capacity: 2000 pieces per month as per customer demands. Delivery Time: With in 1 - 15 days. 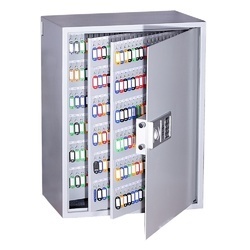 We provide our clients a unique range of Key Boxes, that are perfect to keep all keys at one place. Available in various elegant designs and shapes, these can also enhance the decor of the wall. Manufactured from best grade raw material, these can be customized according to specifications of clients. Further, we also make sure that our range is in strict compliance with the international quality standards. 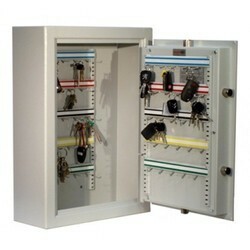 Domestic Key Safe Elegant looking outer box made out of mild Steel and powder coated in Metallic colors. Manufactured on automated CNC machines and it has three Models which can hold 9 keys, 16 keys and 25 safely. It can save lot of time on searching keys at your home. 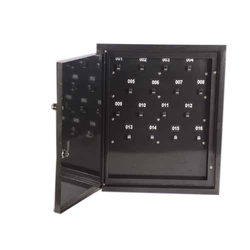 It has pre-printed numbers on every holder so it can be identify key by numbers. Its Administrator could also setup effectively for personnel, keys and so on according to the different service environments so that it will be more convenient to inquiry the keys status. Control to organize keys for taking or returning keys. It solves the problems and matters as much as possible due to incorrect management of keys and misplaced of keys. 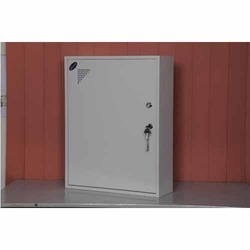 Shri Hari Industries are the Manufacturer , Supplier and Exporter of Domestic Stainless Steel Keybox. Price range start from 7499 - 14999. Production Capacity: 30 pieces per month as per customer demands. Delivery Time: With in 10 - 45 days. 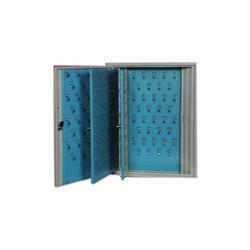 Shri Hari Industries are a Leading Exporter, manufacturer and Supplier of a diverse and a customize range of Industrial Keybox. Price range start from 14,999 - 1,24,999. Production Capacity: 100 pieces per month as per customer demands. Delivery Time: With in 3 - 45 days. Shri Hari Industries are a Leading Exporter, manufacturer and Supplier of a diverse and a customize range of Corporate Builders Choice Keybox. 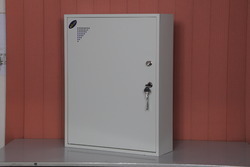 Domestic Steel Key safe is made out of SS- 304, automated machine and in which 9-25 keys can be kept safe. Administrator could also setup effectively for personnel, keys and so on according to the different service environments so that it will be more convenient to inquiry the keys status and record the users’ detailed information. Control to organize keys for taking or returning by internet solves the problems and matters as much as possible due to incorrect management of keys, which realizes unmanned and scientific management of keys. We are the manufacturer of steel dressing almirah, and all type almirah with the stainless steel. 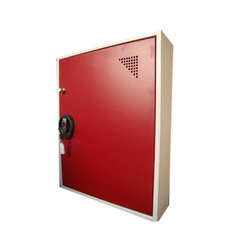 Key Safe Elegant looking outer box made out of mild Steel and powder coated in Metallic colours. 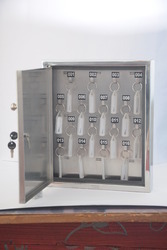 Manufactured on automated CNC machines and it has three Models which can hold 9 keys, 16 keys and 25 safely. It can save a lot of time on searching keys at your home. It has pre-printed numbers on every holder so it can identify key by numbers. Its Administrator could also setup effectively for personnel, keys and so on according to the different service environments so that it will be more convenient to inquire the status of the key. Control to organise keys for taking or returning keys. It solves the problems and matters as much as possible due to incorrect management of keys and misplaced of keys. Key Management guarantees perfect organization of a large number of keys scientifically arranged. Users have to be authorised strictly for taking or returning of keys in advance and then get access to the key cabinet to draw or return keys. The administrator could also set up effectively for personal, keys and so on according to the different service environments so that it will be more convenient to inquire the status of the key and record the users’ detailed information. Control to organise keys for taking or returning by the internet solves the problems and matters as much as possible due to incorrect management of keys, which realises unmanned and scientific management of keys. 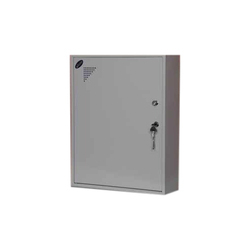 Domestic Stainless Steel Key Safe elegant looking outer box made out of SS- 304 ,manufactured on automated CNC machines and it has three models which can hold 9 keys ,16 keys and 25 safely. It can save lot of time on searching keys at your home. It has pre-printed numbers on every holder so it can be identify key by numbers. Its administrator could also setup effectively for personnel, keys and so on according to the different service environments so that it will be more convenient to inquiry the keys status. Control to organize keys for taking or returning keys It solves the problems and matters as much as possible due to incorrect management of keys and misplaced of keys, which solve problem to manage of keys. 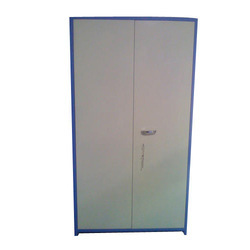 Shri Hari Industries are the Manufacturer, Supplier and Exporter of Steel Key Cabinets. 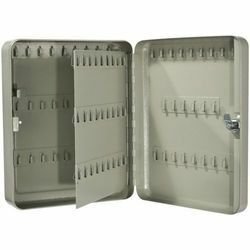 We provide our clients a unique range of key cabinet, key cabinets, steel key cabinets, key boxes, that are perfect to keep all keys at one place. Available in various elegant designs and shapes, these can also enhance the decor of the wall. Manufactured from best grade raw material, these can be customized according to specifications of clients. Further, we also make sure that our range is in strict compliance with the international quality standards. 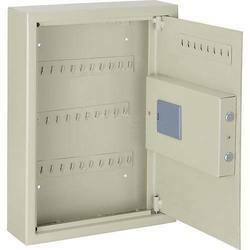 Our organization is engaged in manufacturing, supplying and exporting an ample range of Key Cabinet. These are manufactured in accordance to both domestic and international quality standard. We offer customized solution for the same in order to meet the specific requirement of our valued patrons. 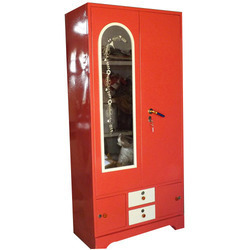 Our range is in high demand and finds application in various schools, college and other institutes. 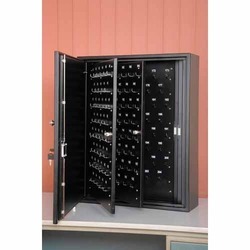 Stainless steel Key Safe is made out of automated machine and in which 9-25 keys can be kept safe. Administrator could also setup effectively for personnel, keys and so on according to the different service environments so that it will be more convenient to inquiry the keys status and record the users’ detailed information. Control to organize keys for taking or returning by internet solves the problems and matters as much as possible due to incorrect management of keys, which realizes unmanned and scientific management of keys. Shri Hari Industries are a Leading Exporter, manufacturer and Supplier of a diverse and a customize range of Corporate Choice Keybox. 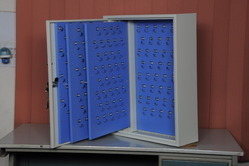 We provide our clients a unique range of Key Safe, that are perfect to keep all keys at one place. Available in various elegant designs and shapes, these can also enhance the decor of the wall. Manufactured from best grade raw material, these can be customized according to specifications of clients. Further, we also make sure that our range is in strict compliance with the international quality standards. 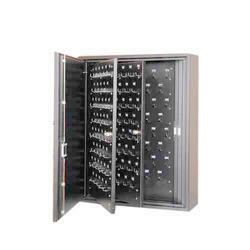 Domestic Stainless Steel Key Safe of Steel Bull brand elegant looking outer box made out of SS- 304 ,manufactured on automated CNC machines and it has three models which can hold 9 keys ,16 keys and 25 safely. It can save lot of time on searching keys at your home. It has pre-printed numbers on every holder so it can be identify key by numbers. Its administrator could also setup effectively for personnel, keys and so on according to the different service environments so that it will be more convenient to inquiry the keys status. Control to organize keys for taking or returning keys . It solves the problems and matters as much as possible due to incorrect management of keys and misplaced of keys, which solve problem to manage of keys. Key Management System guarantees perfect organization of a large number of keys scientifically arranged. Users have to be authorized strictly for taking or returning of keys in advance and then get access to key cabinet to draw or return keys. Administrator could also setup effectively for personnel, keys and so on according to the different service environments so that it will be more convenient to inquiry the keys status and record the users’ detailed information. Control to organize keys for taking or returning by internet solves the problems and matters as much as possible due to incorrect management of keys, which realizes unmanned and scientific management of keys. We provide our clients a unique range of Key chest, that are perfect to keep all keys at one place. Available in various elegant designs and shapes, these can also enhance the decor of the wall. Manufactured from best grade raw material, these can be customized according to specifications of clients. Further, we also make sure that our range is in strict compliance with the international quality standards. We are the manufacturer of Steel Key Almirah. Looking for Key Management System ?